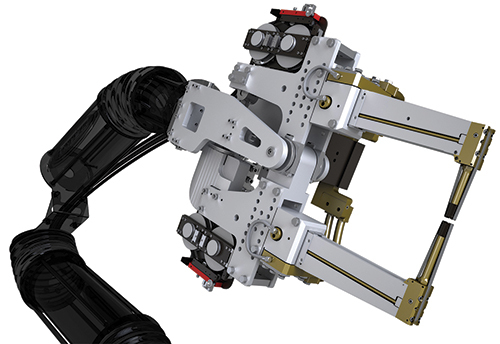 With the previous generation, the reeling and unreeling device for the process tape, welding-gun adjustment and the servo-electric main drive were integrated into the construction of the arm body; they now are located on the base body. As a result of this decoupling, Fronius engineers simplified gun construction and made the design more stable, an absolute must for aluminum spot welding. A powerful mid-frequency direct-current transformer operates at 1000 Hz. This enables the system to readjust every millisecond during welding to help achieve optimum results. And, the transformer and rectifier have been shifted closer to the electrodes to minimize conductivity loss. To speed repair and maintenance of the gun and minimize downtime, components such as transformer, motor control box, tape drive and main drive have plug-in connections. And, engineers simplified replacement of the process tape—the specially coated metal tape inserted between the workpiece and the electrodes that protects the surface of the electrodes against contamination. This ensures that electrode contact surfaces stay clean and each weld uses the identical start situation.